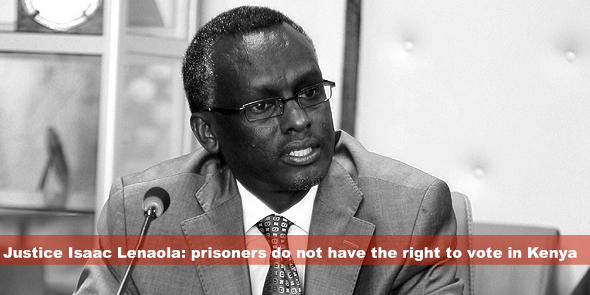 I recently read a ruling by Justice Isaac Lenaola, which categorically stated that prisoners do not have a right to vote in Kenya. This was after several attempts by Kituo cha Sheria, a non-governmental organisation, which had sued the Independent Electoral and Boundaries Commission (IEBC) for failure to have the different prisons in Kenya gazetted so that they could be polling stations. The IEBC did not give any substantial reasons as to why it was not able to register prisoners in Kenya and therefore the question that arises is: are prisoners not citizens of Kenya? any office of any political party of which the citizen is a member. The reading of the above provisions of the supreme law of the country, clearly shows that there is no way that the drafters of the constitution envisaged that prisoners would be locked out from participating in choosing a government of their choice. The disenfranchisement of prisoners generally is premised on assumptions about people in prison that portray them as qualitatively distinct from citizens in the outside world. From this perspective flows a view that disenfranchisement is a reasonable penalty to be imposed upon this class of people. Given the momentum for reform and the changing political environment on felony disenfranchisement, I should explore why this movement has not generally evolved to advocating for voting rights for persons in prison. Political considerations play into this, of course, but perhaps the more fundamental problem is the prevailing sentiment that somehow “prison is different”, and therefore, people in prison deserve to lose the right to vote. In this framing, prisoners are distinct from offenders who are not in prison, and further, disenfranchisement is seen as a reasonable aspect of the punishment that has been imposed on them. But does this rationale hold up to scrutiny? In a broad sense, it seems clear that the imagery commonly ascribed to prisoners cannot help but stigmatise this group of people and lend a certain air of mystery to them. As many have noted, the walls of the prison are erected not only to keep prisoners locked in, but also to keep the outside world locked out. Few journalists venture into this massively funded public operation, and legislators largely take a “hands off” approach unless there is an eruption of violence. As a result, the image of the prisoner is one that is communicated largely through mass media marketing and Hollywood stories. Hannibal Lecter may be at the extreme edge of this portrayal, but cable TV series such as Prison Break and other depictions similarly communicate a picture of angry men (and sometimes women) capable of sudden and seemingly irrational acts of violence. So I begin with a public mindset regarding prisoners that is largely based on overwrought stereotypes and therefore unlikely to be inclined to be supportive of anything perceived as “prisoners’ rights”, But in addition to this framing of the issue, there is also the problematic nature of how prison sentences are viewed as qualitatively distinct from other sanctions, a view that does not hold up to serious scrutiny. While it is true that the vast majority of persons convicted of serious violent crimes are sentenced to prison, in many cases of felony sentencing it is a close call between receiving a prison sentence or being placed on probation with conditions of supervision. As of 2009 Kenya had well over 50 000 prisoners most of whom are eligible to be registered as voters. When the IEBC began the voter registration exercise, its main target was to register 18 million Kenyans. But by the end of the exercise on 19 December 2012, they had barely reached 15 million despite the heavy campaign for people to out and be registered. My argument here is that prisoners would have added significantly to the number that the IEBC was looking. However, no- one helped Kituo cha Sheria in fighting for the prisoners to be registered as voters in accordance with the constitution of Kenya. As law professor Debra Parkes argues, “[t]he reality that prisoners may have an impact on the outcome of elections is an argument in favor of allowing them to vote rather than against it.” All in all my view is that prisoners are allowed to participate in choosing their government as they are also affected by it, and the ruling by Justice Isaac Lenaola was a blow against those fighting for prisoners rights. William Aseka Oluchina has a Bachelors of Law degree from Catholic University of Eastern Africa (CUEA). He works as a Program Assistant at Governance Consulting in charge of Human Rights Advocacy for Children with Disabilities and working as a Research Assistant at Musyoki Mogaka & Company Advocates. His research interest: human rights law in Kenya. (a) I declare that prisoners are, subject to Article 83 (1) of the Constitution entitled to be registered as voters and have the right to vote under Article 38(3)(a) and (b) of the Constitution. (b) I declare that the Independent Electoral and Boundaries Commission has the obligation to observe, respect, protect, promote and fulfill the rights and fundamental freedoms of prisoners and more particularly to facilitate their right to register to vote and to vote. (c) I direct that the Independent Electoral and Boundaries Commission shall put in place measures to ensure that prisoners who are registered to vote are able to vote in first General Election. (d) I direct that the Independent Electoral and Boundaries Commission shall put in place and implement measures to ensure facilitate the right of prisoners to register to vote and vote in future elections and referenda. Thank you so much counsel. I have already seen the judgment by Justice Majanja and noted your concerns. However, I would like to sate i wrote the same article immediately after the voter registration exercise ended and when matter came first before Justice Lenaola. I understand that the position has now changed. You are welcome Counsel. However note that Justice Lenaola never categorically stated that the voters had no right to vote when it came first before him on Certificate of Urgency. He was only concerned about coming to court that late and the process of registration of voters was about to conclude but however certified the matter as urgent and that is how the matter came to be heard by Justice Majanja thus the judgment. I was about to write the same response. Thanks Antony. I see by the first comment that the position has changed since you wrote it. However, either way I disagree with both positions. I believe that the South African position is the best which is more of a half way point as some criminals with minor offences can vote. This is seen as the justification to exclude the more serious offenders which in my mind is reasonable. Would you not agree that for those severe offenders or repeat offenders who out right have no regard for the rights of others and the law in a civil society should not be privy to this right? I could understand the stance that not allowing them to vote could be seen as a double punishment. A punishment on top of the sanction they receive through the criminal trial. However, I think that what you should bare in mind is that it will only be reserved for the percentage of convicts that fall into serious offender category. Now with that in mind I would like to turn to Kenyan Constitution. The reason why that the SA position works is because there is a clause (section 36) in our Constitution that allows all rights to be limited including the right to vote as long as required qualifications for a limitation are met. I have not read the Kenyan Constitution so my apologies for not knowing whether there is such a clause in it. As such if there is no limitation clause I would agree with the section that has been quoted in the article, which would mean that in Kenya all prisoners should have the right to vote. Thank you for your comment. The Kenyan Constitution under Article 38, that Aseka has quoted in his article, allows every adult citizen to be registered as a voter and vote in the general elections and referendum. The only disqualifications under the Constitution to be registered as a voter is when one is declared to be of unsound mind and has been convicted of an election offence (Article 83). There is talk that the IEBC might not set up polling stations in prisons. What are your views on this? The court declared that the failure by the commission to Register the prisoners was unconstitutional and ordered that they be registered….which judgment are you referring to by the way? The Priscilla Nyokabi case? If not I would love to get the citation. Serious offenders are incarcerated to minimize their effect on law-abiding citizens, but voting explicitly provides them with a means to continue affecting the society from which they’ve been removed. Colour me simple, but I just don’t get it.